At present, the government must borrow R1,2billion every weekday to make up its budget deficit which comprises 4,7% of the Gross domestic product (GDP). The interest on the debt already amounts to R209,4billion annually. The government’s wage bill is exorbitant and South Africans’ social needs are increasing year after year because economic growth is inadequate. Unemployment has reached a critical point with 27,2% of the population being unemployed and unemployment among the youth is a national disaster. Approximately 52% of our country’s youth is unemployed. South Africa’s youth unemployment rate is the highest in the world. The government’s labour-restrictive legislation and policies are the root cause of large companies taking their factories and other business abroad, which results in fewer job opportunities in South Africa. South Africa has the ninth highest tax-to-Gross-Domestic-Product-burden in the world. South Africans are being overtaxed to make up the budget deficits caused by the government’s mismanagement and corruption. Expropriation without compensation threatens every South African’s right to owning property and it reduces white South Africans, particularly farmers, to thieves who stole the land or property currently in their possession. After Parliament adopted a motion in favour of the process of making expropriation without compensation possible, the agricultural sector contracted with 29,2 % during the second quarter of 2018. The ANC and EFF’s populist approach to land is destroying South Africa’s agricultural sector and food security. The ANC is looking for a scapegoat to blame for everything that is wrong in South Africa; for all its own failures and for the country’s overall deterioration. The party uses white people as the scapegoat and is trying to retain its supporters by blaming white people and apartheid for all the crises in the country. Racial polarisation is used for short-term political gain. 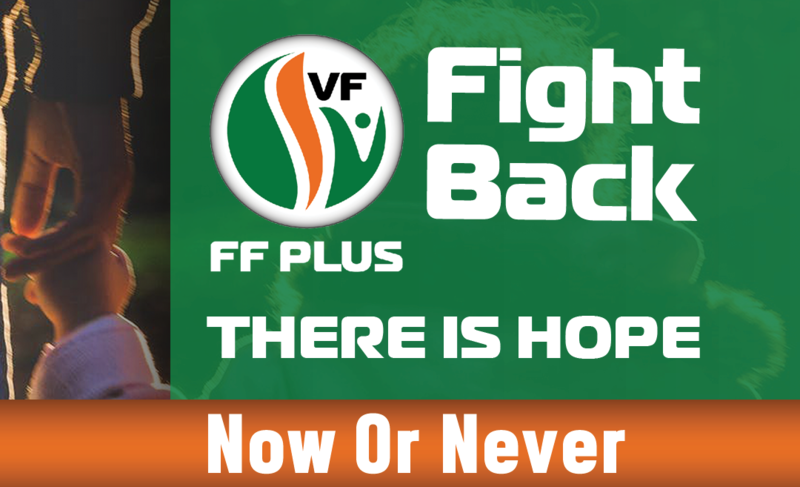 The FF Plus aspires to a political system based on Christian values that is characterised by the principles of justice, truth, love of one’s neighbour, respect for life, loyalty and a peaceful co-existence. A new generation of embittered individuals is forming among Afrikaners, coloured and other nonblack people. People who qualify for support according to any means test and exhibit the potential to perform well are overlooked based on their race. It was a similar bitterness that provided the impetus for the ANC’s power struggle. The FF Plus does not want to see the significant lessons learnt from the past come to nothing and that is why the party strives to prevent history from repeating itself by advocating for equal opportunities for all South Africans. 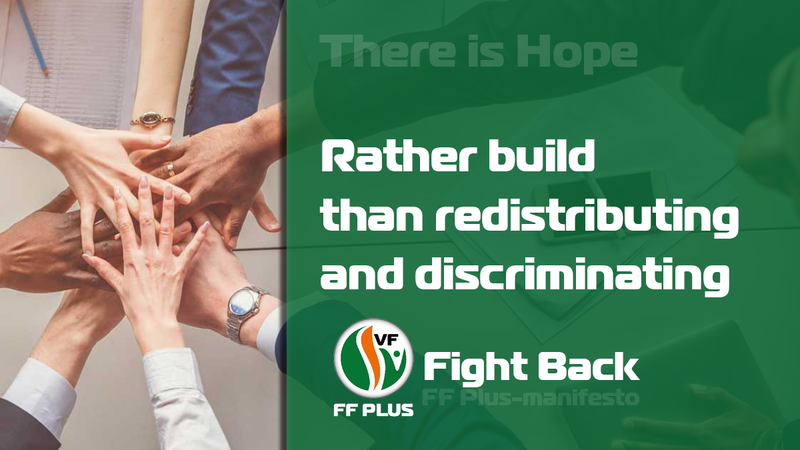 While the ANC is intensifying the conditions of “Affirmative Action”, with the support of other opposition parties, the FF Plus stands firm in the belief that it must be abolished. The government’s objective and policy directions must be focused on building a better future rather than on transformation and redistribution. Economic growth must the number one priority. If there is sustainable economic growth, there will be more funds available to meet social needs, but because economic growth also results in more job creation, less people will be dependent on the state’s social functions. At the moment, though, economic growth is restricted by the government’s policy directions, mismanagement and poor service delivery. In order to ensure policy certainty, effective government and adequate infrastructure development it is imperative to create a favourable environment for the private sector to invest, to create jobs and to stimulate economic growth. The key point of the FF Plus’s policy is to transform South Africa from a territorial state to one where communities are the fundamental units and where the government acts merely as a commonwealth of communities. In order to achieve that, republican thinking must be revived. The ANC government’s greatest failure is the terrible condition of our municipalities. Service delivery has collapsed and most municipalities are basically bankrupt and unsustainable. Such a council must have control of the relevant community’s education, heritage conservation and social care. Worldwide, these are considered the basic aspects in which national minorities can exercise self-determination. A legal framework must be established for purpose-driven communities. In practice it would mean that the governing bodies of all schools, social institutions (for example, oldage homes and children’s homes) and heritage institutions (for example, museums and heritage sites) can decide whether or not it wants to reside under the authority of the government or the community council. Due to limited job opportunities and little economic growth, there is a small tax base and yet great social expenditure. This coupled with the government’s exorbitant wage bill leads to excessive government debt along with interest on that debt and ultimately it is pushing the country closer and closer to the fiscal edge of ruin. In many cases, the police’s handling of these cases falls short and victims are not offered proper protection. The state subsidies paid to children’s homes are particularly inadequate. In some provinces, the subsidy comes down to only R17 per child per day. Seeing as these children’s homes are tasked with taking care of homeless children who have been placed in the state’s care by the court, it is unacceptable that many of these homes are on the verge of closing their doors. • State funding of non-profit organisations, like children’s homes and homes for the elderly and people with disabilities, must be increased. 2. Strikes and particularly illegal strikes that lead to the loss of hundreds of thousands of job opportunities must be prohibited. Trade unions’ power must be restricted and any irresponsible actions that lead to the loss of jobs must by prohibited by legislation. This policy is aimed at transforming the South African population from one that is dependent on social grants to one that functions as the drive behind the country’s economic growth. Neglecting mother-tongue education contributes to poor performance and a high drop-out rate. The fact that Afrikaans- and English-speaking learners receive instruction in their mother tongue explains why a larger percentage of these Grade 1 learners go on to complete Grade 12. Even on tertiary level, mother-tongue education has measurable benefits. Thus, the foundation of the FF Plus’s educational policy is that all learners must have access to mother-tongue education – it will, of course, not be forced on anyone. Early childhood development is of the utmost importance and must be the responsibility of the Department of Education and not the Department of Social Development. At present, South Africa’s expenditure on this phase of education is one of the lowest in the world. The most important formative years in a child’s life are between the ages of zero to four years as that is when the brain develops the fastest. If proper development does not occur during these formative years, children may struggle in school later on. Quality early childhood development training will improve learners’ performance in school and address the problem of a poor throughput rate. Thus, the FF Plus advocates the recognition and development of all South Africa’s indigenous languages. It is a myth that a language will survive as long as it is spoken. The reality is that there are languages that disappear on a daily basis because they do not have the power and the means to hold their own in the face of more dominant languages. The conservation and development of the higher functions of South Africa’s 11 official languages must be prioritised. Thus, for example, the mediums of education, should be expanded to include more languages instead of being reduced or anglicised. Educational experts from across the world agree that mother-tongue education promotes academic performance. • More schools and universities must be built and measures must be implemented to execute the Constitution’s provision that everyone has the right to receive instruction in the official language of his/her choice. The FF Plus’s policy is that the utilisation of biological resources must be approached in keeping with how the world unfolds. The cultural value that various cultural groups (including the Afrikaners) ascribe to land, forests and fisheries must be recognised. At the same time, the need for food security and the role that commercial agriculture plays in it must also be recognised. Tariff protection, research, disaster relief and the creation of infrastructure must benefit all these groups. The FF Plus holds the view that land that has been beneficiated through land reform projects, of which 90% have failed and unused state-owned land should be redistributed immediately and after that, the principle of “willing seller, willing buyer” must be followed. In the case of expropriation in the public interest, the compensation must be market related. Land reform projects have become a breeding ground for corruption. The FF Plus is of the opinion that land that is redistributed in the aforementioned ways must be transferred to the beneficiaries. The beneficiaries must be in possession of the title deeds of the land. The government’s involvement in these projects must be kept to a minimum and partnerships between emerging farmers and commercial farmers should rather be established. Farm murders remain a crisis and the death rate shows that at present, it is more dangerous to be a farmer in South Africa than a police officer. The agricultural community is left vulnerable as the government’s rural safety plan is failing due to a shortage of human and other resources. Rural safety must prevent farm attacks and other rural crimes, like the theft of livestock. 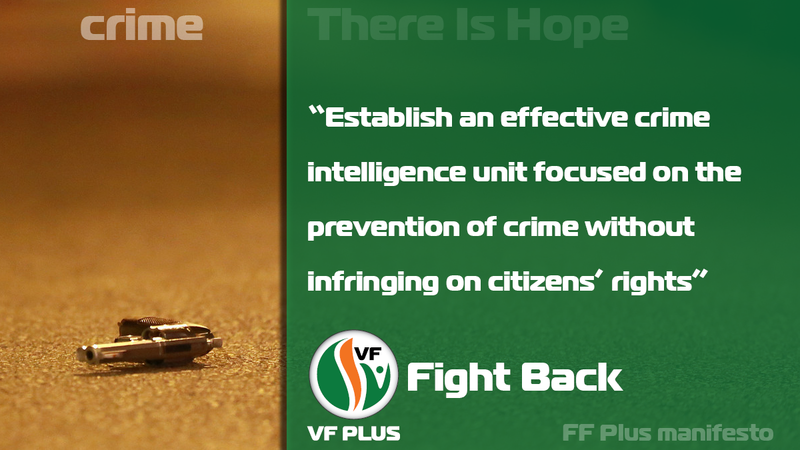 • Establish an effective crime intelligence unit focused on the prevention of crime without infringing on citizens’ rights. 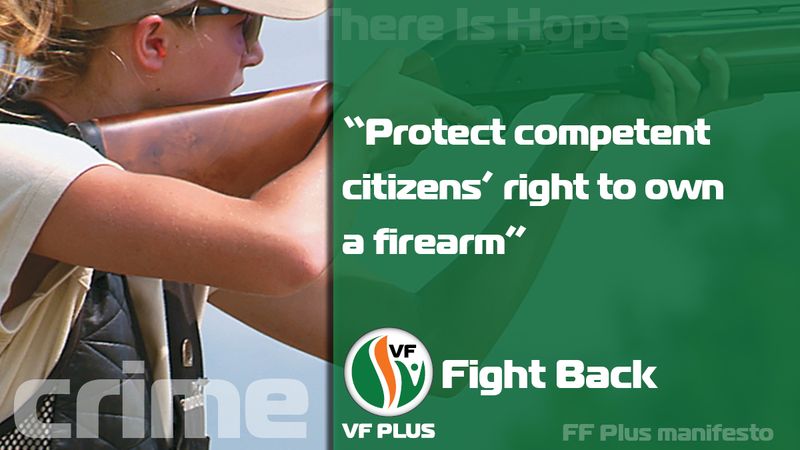 • Protect competent citizens’ right to own a firearm. • The police’s rural safety plan must involve and empower private rural safety networks. • Decisive action must be taken against drug trafficking by, for instance, effectively intercepting drugs smuggled across our country’s borders. The FF Plus insists that South Africa’s foreign relations may no longer be influenced by the countries that loyally supported the ANC before 1994. If one considers those countries’ own human rights track records, it is clear that they were more interested in holding sway over South Africa than in the democratic rights of South African citizens. The ANC government’s foreign relations exhibit numerous contradictions. The FF Plus demands clarity and guidelines that the government itself is also willing to follow. • Reinforce South Africa’s central role in Africa. The quality of a defence force is determined by its equipment and its people. South Africa falls short in regard to both of these. The country’s military force deteriorated significantly as a result of longterm financial shortages and neglect due to poor maintenance. However, an even more serious problem is the lack of expertise and discipline in the defence force. At the moment, the only thing that counts in South Africa’s favour is the fact that there is no obvious and immediate foreign threat. The FF Plus demands effective border control. The integrity of our country’s borders must be restored. “Soft” borders result in an influx of people when there is an increase in economic pressure elsewhere in Africa. It also means that domestic goods, like rhino horns, and foreign goods, like firearms and drugs, can move across our borders. It also makes it easier for ruthless traders to avoid tariffs that are implemented to protect the local economy. • Effective border control that restores the integrity of our country’s borders. Whatever the cause may be, the solution is not only to limit carbon emissions, but also to increase the binding thereof. 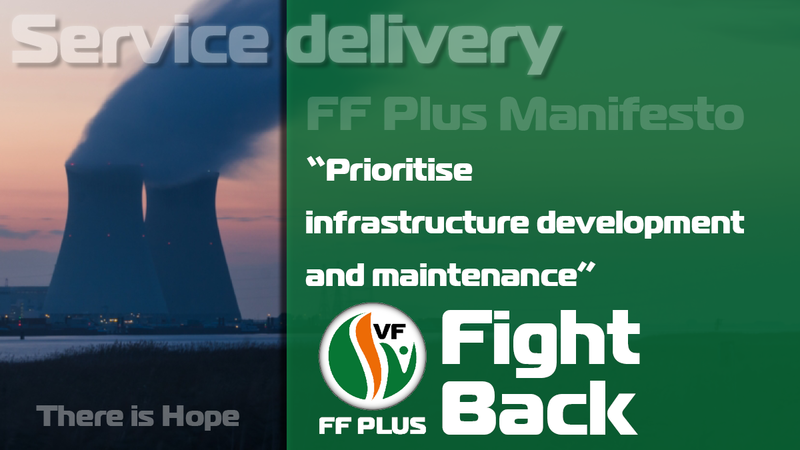 Here the FF Plus’s policy on energy plays a central role. Protect everyone’s right to private ownership of property. Realise communities’ constitutional and internationally recognised right to selfdetermination. 4. Fight back against corruption, misappropriation and excessive taxes and levies – Expose and eradicate all forms of corruption and misappropriation.